← Chocolate chip & pecan cookies. Winter is officially here but if you ask me it’s been here for a while now. Most evenings I am curled on the lounge with the heat on cupping a hot chocolate. I have now also added a bowlful of pear crumble to my evening to keep me extra warm. Whilst apple crumbles are gorgeously sweet and rhubarb crumbles are beautifully tart my weakness is a perfect pear crumble. Beurre Bosc Pears mingle in the oven with sugar, vanilla and butter getting to know eachother real well and then I cover it in a thick blanket of crumble mixture made with more butter, sugar and a good pinch of cinnamon. To me nothing is quite as warming on a cold evening as a perfect pear crumble. And don’t forget the cream. Double cream of course. Pre-heat oven to 200ºC. Mix pear wedges with caster sugar water and vanilla extract and then place in a four cup capacity baking dish. Dot with chopped butter, cover with foil and place in the pre-heated oven for 45 minutes, remove foil and bake for another 10 minutes. For the crumble place the flour, ground cinnamon and softened butter in a bowl and rub together with your fingertips until the mixture resembles coarse breadcrumbs. Add the brown sugar and flaked almonds and mix with a spoon to combine. Top the pear mixture with the crumble mixture evenly and then bake in the oven for another 20-25 minutes until crumble is dark and golden. Serve warm with a good dollop of double cream. i love that photo, it makes me crave crumble even though its 9am …. The leftover’s were begging me to eat them for brekkie this morning but my hips said no – boooo! I will be eating it for dessert as soon as I get off the cross-trainer tonight though. Ooh yes pear is often passed over in favour of apple but pear crumble sounds gorgeous! 😀 Bring on Winter with these desserts! Thanks Lorraine. Pears do make the perfect crumble. Delicious! I have such a soft spot for crumbles. And perfect for this winterish weather! I have too soft a spot for Crumbles. Especially with lashings of double cream. Gorgeous photo! 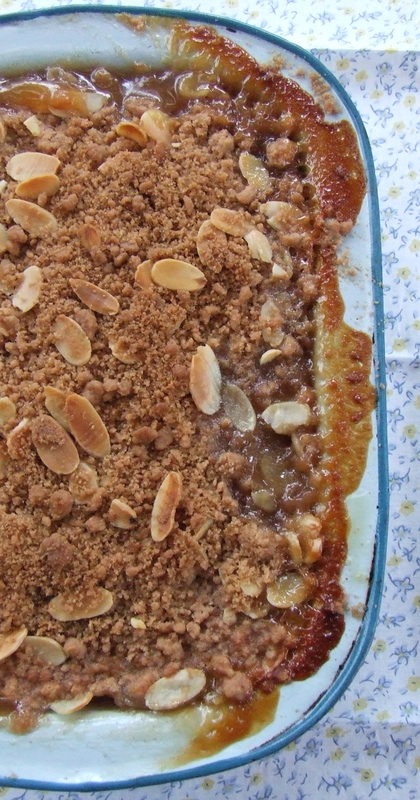 I haven’t tried making a pear crumble before – sounds like the perfect winter treat! I am a pear girl myself! Thanks for sharing the recipe – I am loving the addition of the flaked almonds on top! Yum! I think pear crumble is my fave too. Sometimes I throw in a few frozen raspberries as well – so good. It that one of those rectangular enamel/metal pie dishes? If so, I make mine in the same dish. Hehe. I like that we’re possibly eating the same thing from the same dish in the same city on these cold nights. Yes I use an enamel baking dish. It’s so nice to think someone else is making the same thing as me 🙂 I will definately make this with some frozen raspberries next time, thanks for the tip.